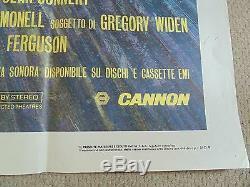 ORIGINAL ITALIAN 2 FOGLIO CINEMA POSTER. 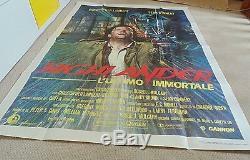 RARE 100% ORIGINAL ITALIAN CINEMA POSTER. PICS ARE OF ACTUAL ITEM WINNER WILL RECEIVE. PLEASE CHECK OUT ALL THE PICS FOR POSTER CONDITION. THEY ARE A FAR BETTER DESCRIPTION THAN I CAN EVER GIVE ZOOM IN ON PICS. 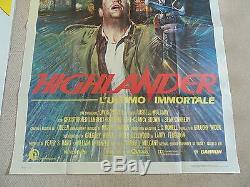 100% GENUINE ITALIAN 2 FOGLIO CINEMA POSTER WHICH WAS USED AT THE CINEMA FOR PROMOTION OF THE SAID FILM BACK IN 1986. IT IS FOLDED AS ISSUED TO THE CINEMA. VERY GOOD CONDITION WITH AMAZING ARTWORK. ONLY LIGHT WEAR TO FOLDS CROSS FOLDS WITH PIN HOLES LIGHT STAINS FROM BLU TAK I THINK TO EDGE BORDERS NOTHING FATAL A VERY NICE ORIGINAL POSTER. SIZE APPROX : 39 X 55 INCHES. FOLDED AS ISSUED TO THE CINEMA. STUNNING 80's ORIGINAL WITH VERY COOL ARTWORK. HAPPY TO POST WORLDWIDE WITH TRACKING. 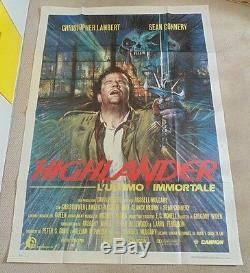 The item "HIGHLANDER ORIGINAL HUGE ITALIAN 39 X 55 CINEMA POSTER 1986 CONNERY LAMBERT" is in sale since Tuesday, March 7, 2017. 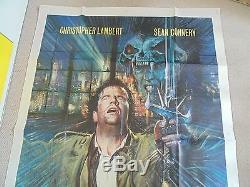 This item is in the category "DVDs, Films & TV\Film Memorabilia\Posters\Originals - Worldwide\1980s". The seller is "sexysi247" and is located in Romney Marsh. This item can be shipped worldwide.